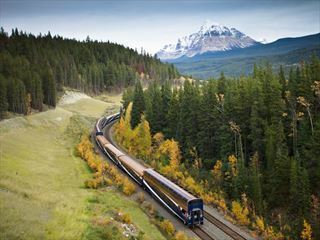 Explore the very best of the Rockies by rail on this scenic adventure. Beginning in Calgary, the tour starts in style with a helicopter trip over the Rockies. 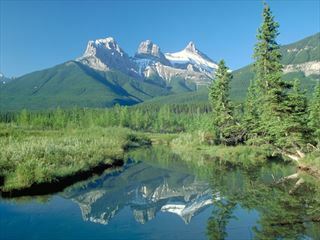 You'll visit the national parks of Jasper, Yoho and Banff and stay in the famous Fairmont Chateau Lake Louise. Afterwards, you’ll head out on the renowned Rocky Mountaineer to journey in style across the Rockies to Vancouver, where your amazing adventure comes to an end. Arrive into Calgary and transfer independently to your hotel, spending the remainder of the day sightseeing in the ‘Heart of the New West’. 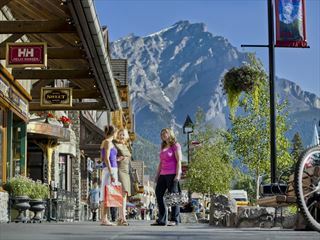 Depart from Calgary this morning and take part in a full-day tour which ends in Lake Louise. 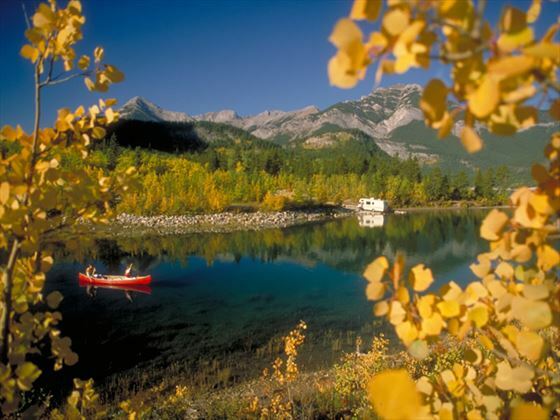 Head to Kananaskis where you’ll take a 12-minute Summit Helicopter Tour over the Rockies. 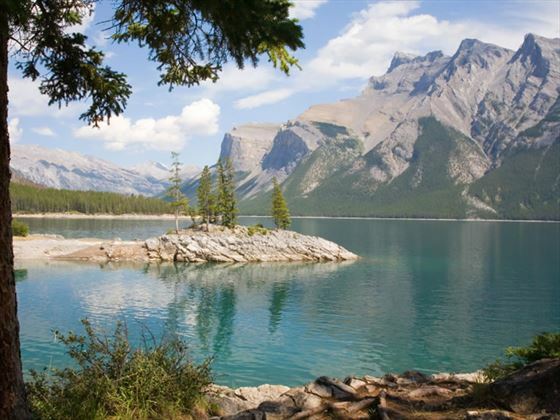 * Continue on to Banff for a sightseeing tour which takes in Bow Falls, Lake Minnewanka, Surprise Corner and the Hoodoos, and you'll also enjoy a trip on the Banff Gondola to the summit of Sulphur Mountain. 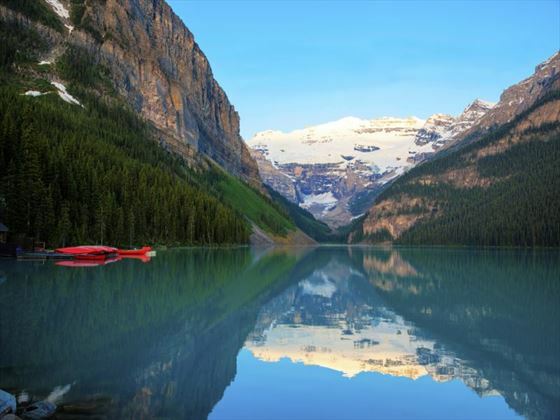 Take a sightseeing tour of Banff and Jasper National Parks via the Icefields Parkway, where you’ll enjoy landmark attractions such as Bow Lake, the Athabasca Falls and the Columbia Icefield. At the Columbia Icefield, the largest accumulation of ice south of the Arctic Circle, you’ll ride on an Ice Explorer to the middle of the Athabasca Glacier where you’ll learn more about the geological features. There’ll be time for lunch (not included) before arrival into Jasper in the late afternoon. 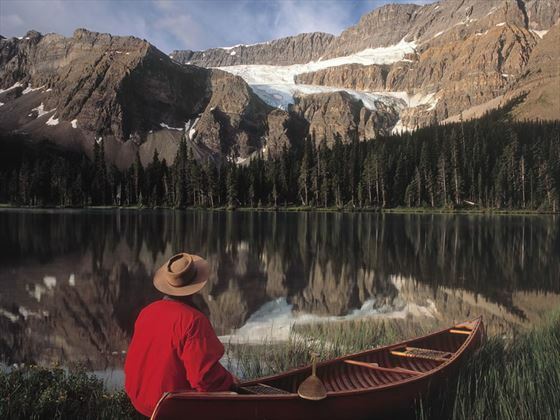 Today you will enjoy a scenic half day tour of Jasper National Park including the top natural attractions, snow-capped peaks and native wildlife. The rest of the day is free for you to explore more of this area at your own pace. 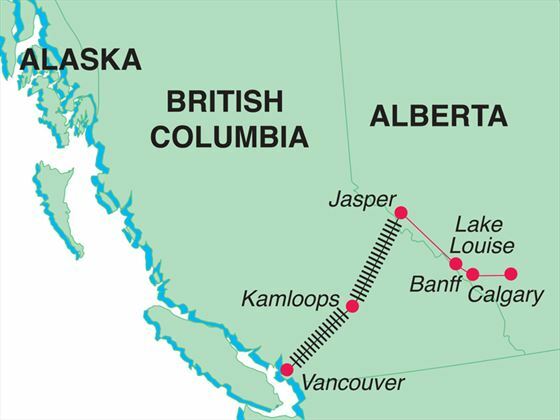 Journey to Kamloops today aboard the Rocky Mountaineer, heading into the interior of British Columbia and watching out for the dramatic scenery changes. 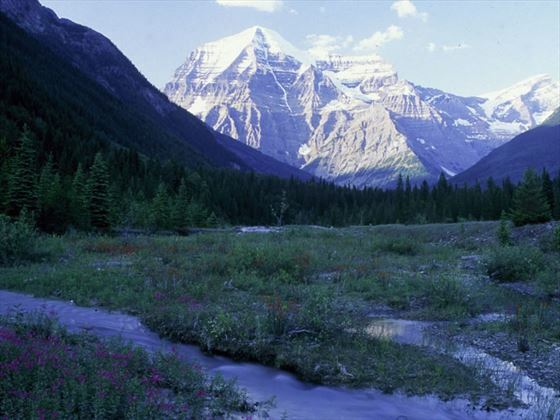 Keep watch for Mount Robson, Pyramid Falls and the North Thompson River, among other natural wonders along the route. Head west towards Vancouver and the Pacific Ocean, past Fraser Valley and Thompson River. 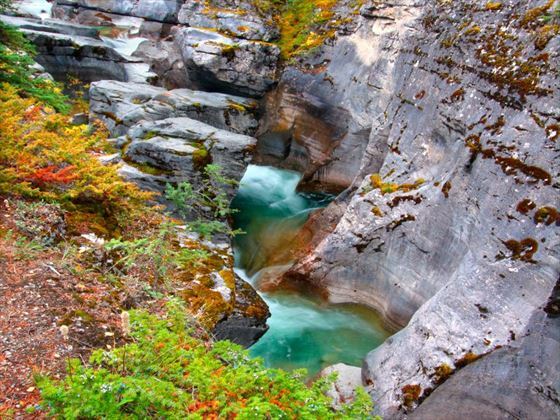 Marvel at the steep slopes and an rushing waters of Hall's Gate in the Fraser Canyon. 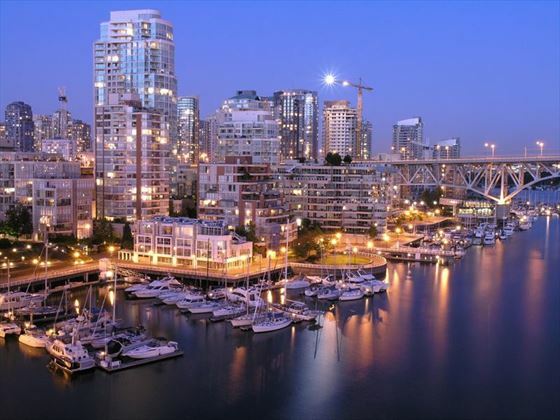 Your rail journey ends upon arrival into Vancouver. Today marks the end of your trip; check-out of the hotel and make your way to the airport for your return flight. Journeying from sky to sea you will travel through craggy Rocky Mountain passes and tour Pacific coastlines with stunning vistas of fjords and glacial valleys before you embark on your Holland America Alaskan Cruise.